Posted on 2019-03-24 02:33:50 GMT+0000 by Neil Godfrey. This entry was posted in Biblical Studies, OT Archaeology & Literature and tagged Biblical Israel, Jonathan Bernier, Merneptah Stele. Bookmark the permalink. The point would have been better made with the mention of “Ahab of Israel” and his 2,000 chariots and 10,000 soldiers as a member of the coalition that fought against Shalmaneser III at the battle of Qarqar in 853 BCE according to the Kurkh Monoloth Stele (the only reference in “Israel” in Assyrian inscriptions–the northern kingdom is elsewhere called either Bit Humri or Samaria). Unlike the Merneptah Stele, this links up to biblical historiography–although it can be argued that the account of Ahab in Kings shows a remarkable ignorance of his reign, which omits his participation in (and likely death at) the battle of Qarqar. Minor point….• Scotland takes its name from the ancient Scots who crossed the Irish Sea and settled in Scotland, leaving the Scots of today being the descendants of the Irish Dal Riada Scots who invaded and colonized from Ulster…Eire. This is estimated to have taken place starting in the third century CE. Prior to their arrival, it was the Picts who were considered to be the inhabitants of Alba, now Scotland. The Scots from Ireland most likely intermarried and eventually assimilated the earlier Picts. Killebrew, Ann E. (2012) [now formatted]. Biblical Peoples and Ethnicity: An Archaeological Study of Egyptians, Canaanites, Philistines, and Early Israel, 1300–1100 B.C.E. Society of Biblical Lit. p. 154. ISBN 978-1-58983-677-8. • or a word with no relationship to the name Israel at all (Nibbi 1989, 38–44, 73–75). 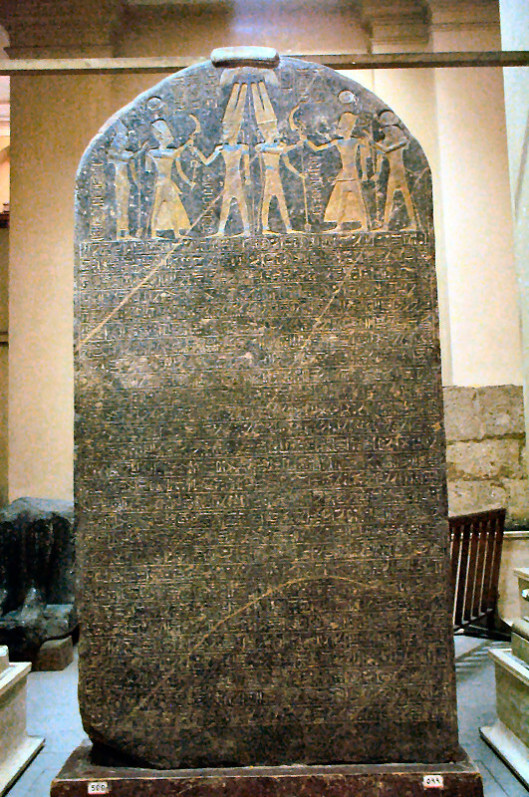 The discovery of the Merneptah Stele according to wiki site for Flinders Petrie. Hamlet:“Do you see yonder cloud that’s almost in shape of a camel? Davies, Philip R. (2016) . “Early Judaism(s)”. On the Origins of Judaism. Routledge. pp. 3–4, 15. ISBN 978-1-134-94502-3. Ancient Israel and Judah were not “communities of faith” as distinct from any of their neighbours, all of whom had their own deities also. We cannot know in much detail what the religions of these ancient societies were, but the books of Judges—Kings and the archaeological evidence agree that much religious practice in these two kingdoms largely conformed to local patterns (“worshipping the Baals”). Bernier’s belief in, or teasing allusion to, an eternal or “forever” truth is clearly a religious belief. His love of Israel as a “stumbling block,” is specifically from a phrase in, and belief in, the Bible. We hope Bernier is just joking or teasing. But it does rather seem as if he is rather serious. In any case, we might note that even if it existed, any such “eternal” Israel was destroyed early on (by Assyria 722 BCE, with Judah, by Babylonia, c. 586?). “The Great Divide in Biblical Studies”. Really? Is that sort of sensational characterisation of biblical scholarship as a binary opposition of two warring factions either particularly true or helpful? The internet is often susceptible to that sort of binary thinking, but I am surpised that it should be expressed so baldly here (or am I?). “Biblical studies” are certainly in turmoil, but there is a vast range of different approaches, opinions and schools, not a “great divide” of the fundamentalist vs. progressive, religious vs. atheist, maximalist vs. minimalist, or any other binary expression people care to coin. I speak as someone who positions himself somewhere in the excluded middle – sympathetic to ideas expressed on either side of this supposed great divide, or perhaps in the no-mans-land between the two supposingly warring hosts – wherever the dividing line or lines are drawn. But it is not no-mans land, and I am certainly not the only one inhabiting this territory. It’s quite well populated. Perhaps one hopeful development is the once highly acrimonious territory of pottery dating. Israel Finkelstein’s low dating brought about something like a “great divide” and mud was slung intemperately, including allegations about the pernicious influence of the religious and/or political affiliations of the various proponents. However, since then, Finkelstein has himself modified his low-dating, adopting a rather less extreme version, and the more traditional scholars have also allowed that some qualified down-dating of pottery phases would be in order. That’s not quite consensus, but it means that, hopefully, Manichæean or apocalyptic rhetoric no longer has much of a place. The various parties are both engaged in the same discussion, batting around various nuanced interpretations, all trying to reach a better understanding of the material… not engaged in the final apocalyptic war of the Sons of Light against the Sons of Darkness. Actually, I suspect that if scholars were less addicted to the emphatic assertion of a precise position, and were more willing to embrace the qualified assertion of ranges of possibilities, then the rhetoric of the battle (the macho μάχη) would have less a far sympathetic environment, and the scholarly enterprise would be far more fruitful. But that’s not the situation between Bernier and the so-called “minimalists”, is it. Nor is it the situation between apologists and critical scholars on other topics. One does not have to look very far to see that the example I gave is far from solitary. I find a lot of value in reading different ideas about a question and there is a lot of good work in biblical studies. But at the same time there is no doubt that biblical studies generally is indeed different from other academic disciplines. See my earlier post https://vridar.org/2015/04/17/unrecognized-bias-in-new-testament-scholarship-over-christian-origins/ where biblical scholars themselves admit this and protest against it. It is a reality. I have engaged with biblical scholars for quite a number of years now and I know first hand how different is the experience from engaging with other scholars in other fields. Just to take a common rather banal example, you will read relatively few books in bookshops by scientists explaing why evolution “is true” and creationism is false that take a hostile, insulting tone towards those with whom they are disagreeing. I am very grateful for some very positive and healthy personal relationships with a fair number of biblical scholars, but I deplore the many, many more biblical scholars who have gratuitously turned on me with insults and outright falsehoods for attempting to engage with them in a serious and professsional manner about what I see as problems in their methods. I do not get those sorts of responses when I have sincere questions for scholars in other fields. I get on the whole respectful, professional responses and explanations in return. Do have a look at that post I linked to above. It is very clear that a good number of the more critical biblical scholars themselves acknowledge that their field is indeed different from others. It is the vast middle that is the problem simply because the majority go into the field because of faith interests. That is surely undeniable. I am, though, very appreciative of the many positive contacts I have had with biblical scholars, too. I only wish those contacts represented the majority of their field. Just a very incidental side-comment — I observed and sometimes engaged with biblical scholars on Crosstalk, especially the first iteration of that forum. I recall one scholar in particular who was professional in his engagement with me (it was Mahlon Smith, highly respected among his peers as a scholar) but then he suddenly flipped a point and asked me, in all seriousness, when I was going to accept Jesus!!! It was evident that many of his peers were of the same mindset. Just look what happened with someone came in questioning the assumptions underlying their methods on the historical Jesus question. There were a nice number who responded professionally and positively. Most resorted to outright insult and mockery, however. Most, not the fringes. The fringe was reserved for the true professionals. Take 3: A few years ago I decided to subscribe to every biblioblog in the “top 50” list since many of these were either run by scholars or took a strong interest in what scholars in their field had to say. How many do you think demonstrate(d) a genuinely scholarly outlook to biblical studies? One does not need to go that far. One only needs to look at the SBL and other conference schedules to see where there is a strong faith-bias in the presentations/presenters. One may think a tiny handful of biblical scholars prominent in the web go “beyond scholarly or professional decorum” but what is significant is when we look at the extent of support and agreement those few have among a large swathe of otherwise quiet peers. It’s not just Bernier. Look at Bernier’s audience. Look at where he publishes and the responses from peers to his work. Ditto for any other outspoken biblical scholar you might care to name. Read the introductions in books where B has a chapter to see where his contribution stands in relation to his peers and look at the work of others engaging with B and how they treat his approach. I think it takes a bit more than just reading a few books on one or two areas of interest to understand the extent of the less than genuinely professional character of biblical studies. And religious interest is not the only factor pressuring scholars like Finkelstein, whom you mention. We have not even begun to address the very powerful political/nationalist and social pressures in the field of biblical/OT archaeology. Omg, Take 4! — You’ve got me reflecting on years of interactions with biblical scholars both in person and online. There are many areas of discussion where widely divergent views are acceptable and welcome and constructive in the overall enterprise of scholarly inquiry. I have never had any unpleasant experience with biblical scholars that I can recall when I have confined myself to these topics. In fact I have been told I have been “not far from the kingom of heaven” for my contributions by one well-known scholar. On the other hand, there are areas where even biblical scholars themselves, or at least some of them, will acknowledge that the foundations of inquiry and hypothesis construction are without any secure foundation at all, sometimes they will admit to logical fallacies at their core. But attempt to address the implications of these feet of clay and that’s where the problems start because the implications take one away from the parameters of what is permitted according to the conventional wisdoms. That is where the “great divide” is. It is not great in the sense of evenly sized up sides, but in the gult between logical and methodological validity and outright fallacy. Further, there are many niches of different ways of approaching a question in biblical studies that permit the ability to totally ignore the different approaches of others. That strikes me as bizarre from the perspective of historical inquiry. In other historical fields we can have Marxist and liberal and all sorts of ways of studying the same set of facts related to a particular event, and historians are expected not only to present their own views but to demonstrate why they are superior to other. Yet in biblical history so often one sees a complete ignoring of alternative perspectives (e.g. Bernier in this case.) That to me makes the whole enterprise a bit of a mickey-mouse game — to each his own hobby horse. In the case of Christian origins the scholars are not even debating (when they do debate) alternative interpretations of core events, but totally divergent inferences (based on assumptions, ideological or faith based) from data so that they construct entirely different events and even characters involved in those events!!! That’s a sure sign there is something very awry with the methods used. The number of biblical scholars who are prepared to address such problems in public forums in a completely open manner where there are no forbidden areas re possible conclusions is very few. Some do raise the questions but those who do tend on the whole immediately to salvage their credentials by simultaneously announcing the permitted limits of their inquiry. None of this is like anything I know or can even imagine in any other academic history discipline. And again, look at that earlier linked post: numerous biblical scholars openly acknowledge this difference. In the field of classics or ancient history, for example, literary analysis (as opposed to textual analysis) is considered an integral part of historical inquiries, yet many biblical scholars dogmatically reject the relevance of literary analysis of the gospels as a tool for the historical inquiry of Christian origins. There is no real comparison between biblical studies and any other academic field I am acquainted with. Amazingly, the same people who write this condescending (and frankly insulting) diatribes are the same people who insist that atheists and non-believers should be “nicer” to them. When a believer cannot refute an idea with evidence, they turn to ridicule and attack the idea, along with anyone who dares to speak it. – Maith thú, a Cheallach! The only Great Divide that I see is the eternal divide between apologetic scholarship and secular scholarship. Neil rightly introduces the possible ambiguities of the term “Israel,” and such open mindedness is suggested by the rest of the empirical data. It’s not just pottery (Finkelstein’s movement in dating pottery is mostly about Philistine, not Israel or Judah). Yet we no longer have to depend upon pottery. Carbon dating now supports most of Finkelstein’s datings of both Northern and Southern kingdoms. The archaeology also supports these dates. Finally, understanding the Biblical accounts will identify when the stories in the Bible were written and from which culture they originated. The physical existence of David/Solomon is not disputed by these data points, nor is it disputed by Finkelstein. It is not even the timing of the United Kingdom that is the most essential data. It is the dense and deep archaeological studies that command us to give up any great cultures in the area before the late 10th or early 9th century. The most Finkelstein can say (using the vast archaeological, textual, and carbon dating) is that David and Solomon probably existed in the far southern regions of Judah in a very sparsely populated area that could never have been any impressive kingdom. So place them in any century you want. It doesn’t change the fact that there never was any United Kingdom as the Bible insists, and that absolutely zero evidence exists for any such interpretation outside of the Bible. As a related follow up to this post. . . . Religion and religious scholars are so suspect, that in America, in most state universities, their religion departments are not allowed on campus, as far as I remember.